Some days you just wake up with a hankering for a really nice bit of steak, but if you are anything like me, that beefy craving is usually for steak of an altogether different variety: Cantonese beef steak! So what makes a piece of steak Chinese? The first thing that makes this dish such a Chinese classic is the sauce. Glossy and rich, this sauce is the perfect mix of sweet and peppery goodness – this isn’t a sauce for the faint of heart! The Worcestershire sauce adds spiced depth, whilst the tomato sauce imparts a hint of colour and extra body once everything has been reduced down to a sticky, gooey sauce. Secondly (and most importantly) is the texture of the meat. Marinated in a batter made with corn flour, eggs and Bicarbonate of Soda, the beef is rendered meltingly tender – almost to the point that the texture of the steak no longer resembles meat. This might sound unappealing, but this technique of tenderising meat with Bicarbonate of Soda is fairly widespread in Chinese cooking where the quality of the meat is not always guaranteed. As unpalatable as it may seem, the use of Bicarb goes a long way in making the Chinese food you make at home actually taste like the cuisine you are striving to emulate. Authenticity isn’t always pretty, especially when making Chinese food! For more Chinese recipes from the Muddled Pantry, please follow the link here. For tips on stocking a Chinese pantry, please follow the link here. I love food that you can just gooi into a pot, forget about for a few hours and it still comes out tasting like heaven. Thankfully, Asian food is abound with such dishes, particularly so in Chinese cuisine. Whilst synonymous with the much hackneyed “stir-fry”, Chinese food does love a jolly good braise. Beef ribs, pork belly, chicken feet – it would seem that the Chinese maxim is clear: if you have a pot big enough for it, then it’s good for a braise. Thankfully, it seems, pork hock fits both the maxim and the pot! 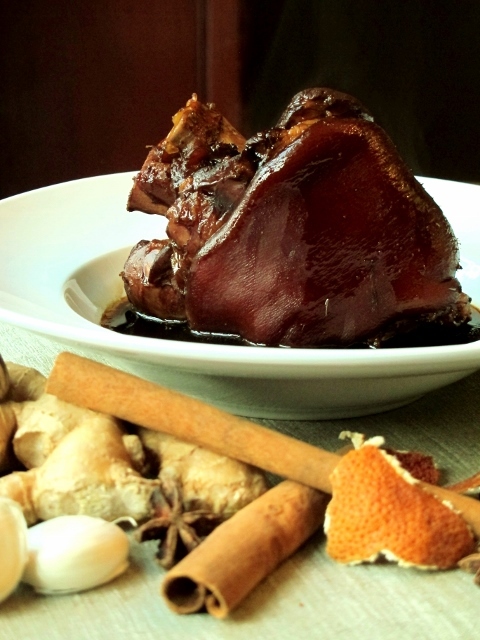 Richly flavoured, red-braised pork hock is an old school Chinese classic and is the perfect way to cook an otherwise troublesome cut of meat. Slowly simmered in what is essentially a classic master stock, the meat and fat is rendered meltingly soft – so much so, one can “cut” through it with just a chopstick. Stained a redish brown from the dark soya sauce, the silky sweet meat is tempered with depth, whilst the aromatic sauce is enriched with the rendered juices from the braised pork. Admittedly, however, like most home-style Chinese cooking, braised pork hock isn’t the most aesthetically appealing dish. Resembling something of a gelatinous heap of meat, skin and bone, it is hardly a feast for the eyes. Rest assured, however, once you’ve taken your first bite you will quickly forget what it looks like. Indeed, this dish is a triumph of flavour over style. Note: the stock quantities may initially seem excessive, but the Master Stock can be kept indefinitely and develops depth of flavour each time it is reused. Simply strain the stock and store in the freezer until needed. Add a fresh set of aromatics to the stock and you are good to go. With the exception of the most amazing Peking Duck I’ve ever eaten, I was disappointed to discover that Chinese food in China is a rather dull affair. Roasted locust and the occasional snake-on-a-stick not withstanding, bland soups and mediocore dumplings seem to be the order of the day on the streets of Beijing. After spending the best part of a week eating possibly the dullest Asian food on earth, we chanced upon a massive subterranean food-court that specialized in regional food from all over China. It was here, in this overcrowded and windowless basement, that we finally discovered some of that allusive “Chinese flavour” in China – we had found Sichuanese food or more specifically, mapo tofu! Little did I know that I stumbled upon what would possible become one of my favourite Chinese dishes of all time. Loosely translating to “grandmother’s pockmarked tofu”, this colorfully named dish has all the hallmarks of a true Sichuanese classic. 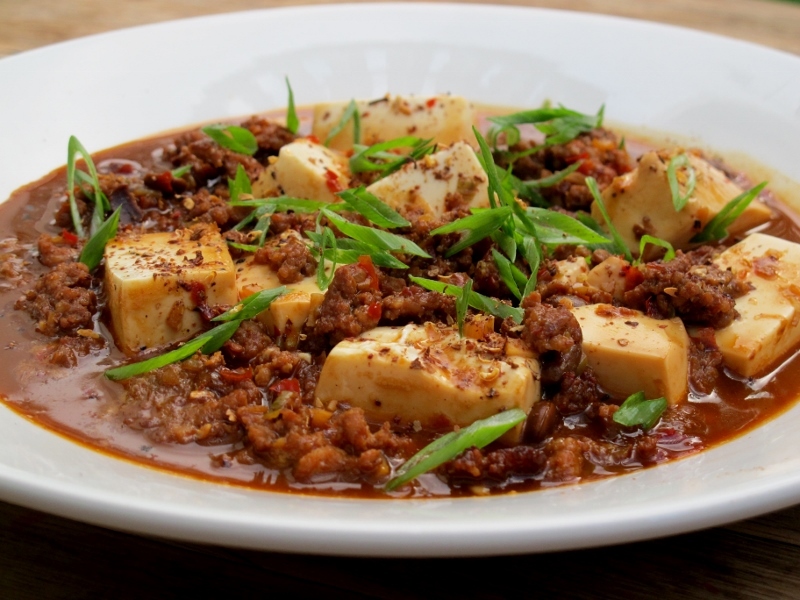 Spicy, stastifiying and, above all, “numbing”, mapo tofu has got it all! Packed full of flavour, it is a great dish to introduce the uninitiated to the unsung delights of tofu. The soft, silky texture of the tofu plays beautifully against the fiery sauce, resulting in a “cooling” contrast to the intensity of the dish. Easy to make and always tasty, mapo tofu is the epitome of Chinese home-style cooking and makes for fantastic meal on its own with just some rice. Equally, though, mapo tofu makes a great addition to a larger Chinese banquet as it can be made ahead of time and then gently reheated before serving (something of a rarity in Chinese cooking).